The perfect fall dish, and the best thing to do with a butternut squash. This dish is the best thing I’ve ever done with those butternut squashes that show up in our CSA boxes or produce departments come fall. The recipe just shouts “autumn”, not only due to its ingredients, but also, because of its seasonal colors and flavors. I found this recipe in a cookbook that I’ve been very much enjoying cooking from lately: Third Thursday Community Potluck Cookbook. It’s a cookbook that I heard about through a group I’m a part of, the Nashville Food Bloggers. One of the reasons I love this cookbook SO MUCH, is that not only has author Nancy Vienneau divided the recipes up seasonally, but she’s even divided them up by the months that the key ingredients tend to come into season. Each month since I purchased it, I’ve cooked a recipe or two from that month, and I absolutely LOVE this choice of layout! Thanks, Nancy! Here’s a link where you can look at the cookbook and decide if you might need one yourself: Third Thursday Community Potluck Cookbook. I happened to find my copy at our local Costco. Today’s recipe comes from her recipes for November, so finding the butternut squash you’ll need for this recipe should be pretty easy. When my kids were babies, I used to make homemade baby food out of butternut squash, and that may be the secret as to why I’m often reluctant to use this veggie when it shows up in my CSA box. It reminds me of that bland baby food I used to make! But in making this recipe, I’ve discovered a few secrets to making butternut squash absolutely delicious, and totally NOT like baby food. Add texture. This recipe has sautéed leeks, but even more important is the crunch of some nuts. The original recipe called for walnuts, which I really loved, but my daughter is not a fan, so I changed the walnuts to pine nuts, which seem more Italian to me, anyway. Good change! Love the pine nuts. Season Aggressively. Don’t be shy with the salt. Use a nice sea salt, and grind in some pepper. I think you could even throw in some hot red pepper flakes, if that floats your boat. Also, while you could substitute Parmigiano Reggiano for Pecarino Romano, it’s worth your while to buy a wedge of Pecarino Romano. It’s a little bit stronger in flavor, and this vegetable benefits from lots of flavor. Taste as you go. Each layer should be delicious. Taste the butternut squash purée. Taste the béchamel leek sauce. Taste the tomato sauce. Each one should taste delicious, on its own. 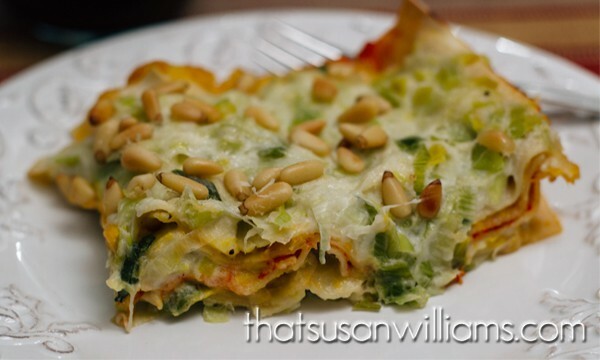 Butternut Squash and Leek Lasagna: tastes even better than it looks! This is a GREAT vegetarian dish: you’ll want to pin this one on Pinterest, for sure. Feel free to share it on Facebook, or tweet it on Twitter, if that’s your thing. Sharing is caring! 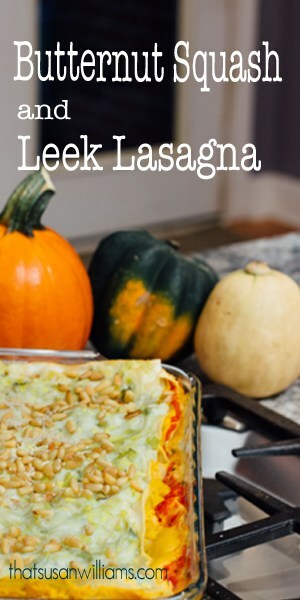 Roasted Butternut Squash and Leek Lasagna is a great recipe, whether you’re a vegetarian, or not. The best way to use any butternut squash that comes your way in the autumn. Roasted, puréed, and layered with a sautéed leek béchamel sauce. Mmmm. Cut the squash in half (starting from the stem end, down), and scoop out the seeds. Brush both sides of the squash with olive oil, and sprinkle with salt and pepper. Place on foil covered rimmed baking sheet, skin side UP, and roast uncovered for 30 to 40 minutes. What you are looking for is for the skin to to brown, and blister slightly, and for the squash to be very soft. Remove from oven and allow to cool. In a 3 qt. saucepan, over medium heat, melt the butter and add the leeks. Sauté for about 7 minutes, stirring often, until the leeks soften and separate. Sprinkle them with flour, and stir rapidly, being sure that all leeks are coated, and giving the flour a chance to cook for about a minute. Pour in the half and half, and keep stirring. Soon, the sauce will bubble and thicken. Add the ricotta and stir well. Season with salt and white pepper. The sauce will be rich tasting and slightly sweet, from the leeks. Warm the olive oil in a small saucepan. Add the tomatoes, and season with salt and freshly ground black pepper. When thoroughly heated, pour into a blender or food processor (I used my Vitamix) and purée. Pour a little olive oil to lightly coat the bottom of a 9x13" lasagna pan. Cover the bottom of the dish with 1/4 of the Béchamel sauce. Place a layer of lasagna noodles over that. Spread 1/2 of the butternut squash purée over that. Sprinkle with chopped sage. Spoon on another 1/4 of the Béchamel sauce. 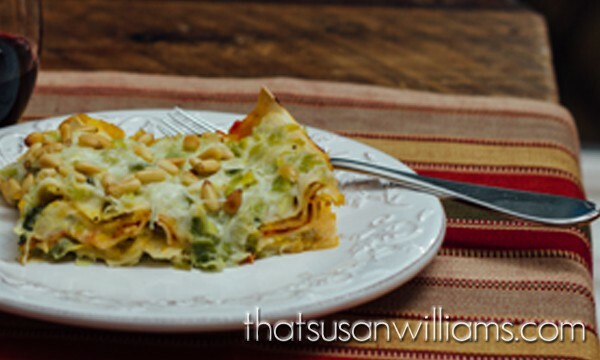 Add a second layer of lasagna noodles. Cover with all the tomato sauce. Sprinkle half of the grated Pecorino Romano over the tomato sauce. Dot with another 1/4 of the Béchamel sauce, and add another layer of lasagna noodles. Spread with the remaining 1/2 of the butternut squash purée, sprinkle with the rest of the chopped sage, and cover with the final layer of lasagna noodles. Cover those with the last 1/4 of the Béchamel sauce, the other half of the Pecorino Romano, and sprinkle the entire pan with the toasted pine nuts. Uncover for the last 10 minutes, to lightly brown the top. I used 4 lasagna noodles per layer, for a total of 16 lasagna noodles, although your mileage may vary. My Béchamel sauce got doled out in approximate fourths. My Butternut Squash Purée got ladled onto two layers: so, in half. The Tomato Sauce (there's only a cup of it) went on all at once: in one layer. The Pecorino Romano cheese got divided in half, as did the chopped sage.